You can use any email provider to receive email on your iPhone. However, if your email account is with a provider other than iCloud, Exchange, Gmail, Yahoo!, AOL, or Outlook, you have a bit more work ahead of you. You’re going to need a bunch of information about your email account that you may not know or have handy. Scan the following instructions, note the items you don’t know, and go find the answers before you continue. To find the answers, look at the documentation you received when you signed up for your email account or visit the account provider’s website and search there. On the Add Account screen, tap the Other button. Fill in the name, address, password, and description in the appropriate fields, as if you were setting up an account for iCloud, Gmail, Outlook, Yahoo!, or AOL. Tap Next. With any luck, that’s all you’ll have to do, although you may have to endure a spinning cursor for a while as the iPhone attempts to retrieve information and validate your account with your provider. Otherwise, continue with Step 4. 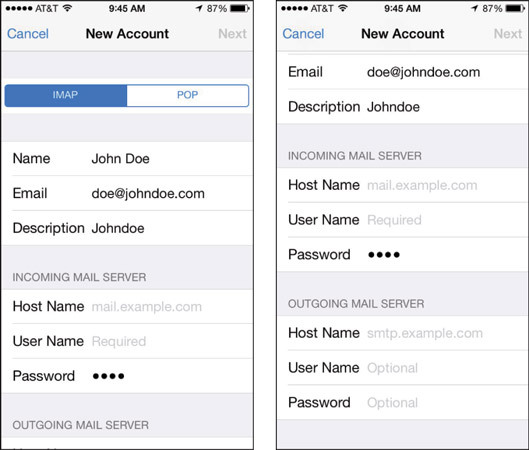 Tap the button at the top of the screen that denotes the type of email server this account uses: IMAP or POP. Fill in the Internet host name for your incoming mail server, which should look something like mail.providername.com or mail.providername.net. Enter the Internet host name for your outgoing mail server, which should look something like smtp.providername.com or smtp.providername.net. You may have to scroll down to the bottom of the screen to see the outgoing mail server fields. Tap the Next button in the upper-right corner to create the account. If you don’t get your email from iCloud, Gmail, Outlook, Yahoo!, or AOL, you may have a few more fields to fill in before you can. Some outgoing mail servers don’t need your username and password. The fields for these items on your iPhone note that they’re optional. Still, you want to fill them in anyway. That way, you won’t have to add them later if your outgoing mail server does require an account name and password, which most do these days. 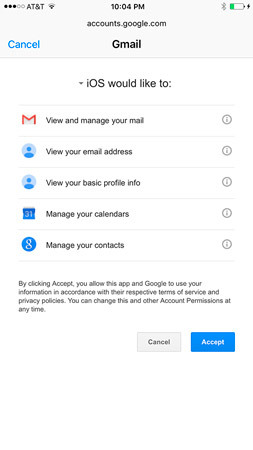 When setting up certain Mail accounts in iOS 9, you’ll see a message like the one for Gmail, in which you’re meant to give or deny permission to the app (and iOS 9) to view and use your information in various ways. Tap Accept or Cancel to proceed. What this Mail account intends to do.